Montebello (Spanish for beautiful mountain) is a city in Los Angeles County, California, United States, located in the southwestern area of the San Gabriel Valley on 8.4 sq mi (22 km2) 8 mi (13 km) east of downtown Los Angeles. It is considered part of the Gateway Cities, and is a member of the Gateway Cities Council of Governments. In the early 20th century, Montebello was a well-known source for oil reserves. At the 2010 census, the population was 62,500. The estimated population as of July 1, 2013 was 63,495. Father Angel Somera and Father Pedro Cambon, both Franciscan missionaries, founded the original Mission San Gabriel Arcangel on September 8, 1771; the location is today near the intersection of San Gabriel Boulevard and the Rio Hondo River. The establishment of the mission marked the beginning of the Los Angeles region's settlement by Spaniards and the fourth of twenty-one missions ultimately established along California's El Camino Real. The mission did well initially as a farm and cattle ranch. Six years after its founding, however, a destructive flood led the mission fathers to relocate the establishment farther north, to its current location in what is the present day city of San Gabriel. The original mission site is now memorialized as California Historical Landmark #158. During the early years of the mission's existence, the region operated under a "Rancho" land grant system. The current city of Montebello consists of land from Rancho San Antonio, Rancho La Merced, and Rancho Paso de Bartolo. The Juan Matias Sanchez Adobe, built in 1844, still stands at the center of old Rancho la Merced in East Montebello. Recently restored, Rancho la Merced is the city's oldest standing structure. On January 8, 1847, the Battle of Rio San Gabriel took place in what are today parts of the cities of Whittier, Pico Rivera and Montebello. The battle was a decisive victory for the U.S. Army, giving control of Los Angeles and Alta California to the United States, and is viewed by historians as a critical juncture in the Mexican-American war. Today the site is California State Historical Landmark #385; and there are two cannons and a plaque commemorating the battle that overlook the river on Bluff Road and Washington Boulevard. Following the American Civil War, some 5,000 acres (2,000 ha) of the East Los Angeles area was owned by Alessandro Repetto, an Italian immigrant settler from Genoa, Italy. Following Repetto's death in 1885, his brother sold his rancho to a consortium of five Los Angeles businessmen including banker Isaias Hellman and wholesale grocer/historian Harris Newmark for $60,000, approximately $12 per acre. The land was later divided among the partners, one large parcel of approximately 2,000 acres (810 ha) going to a partnership of Newmark and his nephew, banker Kaspare Cohn. It was out of the Newmark and Cohn share of 1,200 acres (490 ha) that city Montebello had its beginnings in May 1899. After receiving the advice of hydraulic engineer William Mulholland for the drafting and building of the town's water system, the land was subdivided. In 1900 the completed water system was incorporated as the Montebello Land and Water Company. An area of 200 acres (81 ha) adjacent to the tracks of what was formerly the San Pedro, Los Angeles & Salt Lake Railroad was developed into a townsite called Newmark, bounded by Los Angeles Avenue on the south, 1st Street on the east, Cleveland Avenue on the north, & 5th Street on the west. The remainder of the land was subdivided into 5 acres (2.0 ha) lots suitable for small-scale agriculture. On Mulholland's suggestion, Montebello was adopted as the city's name, replacing the original name Newmark. Originally an agricultural community, Montebello was formerly known for its prolific production of flowers, berries, fruits, and vegetables. The first public flower show was sponsored by the Montebello Women’s Club and held in the Montebello High School auditorium on Whittier Boulevard in 1912. The Montebello – El Carmel (South Montebello) Improvement Association, the predecessor of the Montebello Chamber of Commerce, operated from September 1907 to April 1912. with its stated purpose "to improve and beautify the community." Some of its early achievements included: seeing Whittier Boulevard paved, trees planted along the streets, establishment of the city's first high school, working to drop the name of "Newmark" and having the entire area incorporated as "The City of Montebello". On October 19, 1920, the city was incorporated and its name officially changed to "Montebello". In honor of Montebello's agricultural roots, the city's official seal contains a red poinsettia in the center. much of south Montebello, was populated by Japanese American farmers who would lose their property during the WW II internment of US citizens. many of the displaced residents were unable to return to their homes. Citation Executive Order 1066 . The Family of M's Flowers can trace their history and participation In the growth of the all flower industry, largely through their efforts. The Standard Oil Company discovered oil in the Montebello hills in 1917 on the Baldwin and Temple properties; this discovery changed the face of Montebello. What were formerly hills full of agriculture became oil fields. Eventually, the oil taken from the soil in Montebello would produce one-eighth of the crude-oil in California. Over the course of sixty years, the Montebello hills were filled with producing oil wells. The population was spread out with 16,142 people (25.8%) under the age of 18, 6,414 people (10.3%) aged 18 to 24, 17,567 people (28.1%) aged 25 to 44, 13,857 people (22.2%) aged 45 to 64, and 8,520 people (13.6%) who were 65 years of age or older. The median age was 34.7 years. For every 100 females, there were 93.3 males. For every 100 females age 18 and over, there were 89.5 males. As of the 2000 Census, there were 62,150 people, 18,844 households, and 14,867 families residing in the city. The population density was 7,536.9 people per square mile (2,908.6/km²). There were 19,416 housing units at an average density of 2,354.6 per square mile (908.7/km²). The racial makeup of the city was 46.82% White, 0.90% African-American, 1.23% Native American, 11.64% Asian, 0.08% Pacific Islander, 33.85% from other races, and 5.48% from two or more races. Hispanic or Latino of any race were 74.57% of the population, some of which are also included in the census of the white population. There were 18,844 households out of which 40.2% had children under the age of 18 living with them, 51.5% were married couples living together, 20.1% had a female head of household and 21.1% were unrelated individuals. 17.1% of all households consisted of a single individual and 8.0% had persons who were 65 years of age or older living alone. The average household size was 3.28 and the average family size was 3.67. The 2000 census data counted persons as 28.6% under the age of 18, 10.4% from 18 to 24, 30.3% from 25 to 44, 18.2% from 45 to 64, and 12.4% who were 65 years of age or older. The median age was 34.32 years. For every 100 females, there were 92.4 males. For every 100 females age 18 and over, there were 88.3 males. The median income for a household in the city was $38,805, and the median income for a family was $41,257. Males had a median income of $30,423 versus $26,590 for females. The per capita income for the city was $15,125. 16.3% of residents have a bachelor's degree or higher and 69% of residents have a high school degree. About 14.2% of families and 13.2% of the population were living below the poverty line, including 24.3% of those under age 18 and 10.7% of those age 65 or over. In the California State Legislature, Montebello is in the 32nd Senate District, represented by Democrat Bob Archuleta, and is split between the 58th Assembly District, represented by Democrat Cristina Garcia, and the 49th Assembly District, represented by Democrat Ed Chau. In the United States House of Representatives, Montebello is in California's 38th congressional district, represented by Democrat Linda Sánchez. Montebello utilizes a city council/city administrator form of government. The city council provides political leadership and policy direction. Montebello's current elected City Treasurer is Ashod Mooradian. and the current elected City Clerk is Irma Barajas. The city administrator works under the direction of the City Council, and functions as the manager of city employees and the department heads. Montebello has six department heads and some oversee more than one division. The most recent Mayor Vanessa Delgado resigned from the Montebello City Council on August 13, 2018 so she could be sworn as a California State Senator. The City Council is composed of five members elected at large by the citizens of Montebello to serve for four-year overlapping terms. The Los Angeles County Department of Health Services operates the Whittier Health Center in Whittier, serving Montebello. The United States Postal Service operates the Montebello Post Office at 145 North 5th Street and the Montebello Hills Post Office at 2547 Via Campo. Montebello has its own police department consisting of 74 sworn officers, which includes the Chief of Police, two captains, five lieutenants and ten sergeants. The department also employs 24 civilian personnel organized into three divisions: Field Services, Investigative Services, and Support Services. The Chief of Police is Brad Keller who started his law enforcement career with Montebello in 1991. Chief Keller is the tenth police chief of Montebello Police Department since 1920. Augmenting the department are a Reserve Officer Corps, a Police Explorer Program, a Police Chaplain Corps and a civilian "Citizens on Patrol" program. The department provides a variety of services to citizens including Neighborhood Watch, the Citizen’s Academy and a child seat loan program. The Crime prevention Bureau provides free security inspections to local businesses and residents. The Montebello Fire Department is divided into five divisions: Fire Administration, Operations, Communications, Fire Prevention, and Emergency Preparedness. Fire Chief Dominic Hebert oversees the Montebello Fire Department. The Fire Administration division has control over the fire department's functions ranging from the budget to policy and personnel. The operations division oversees emergency response teams including emergency medical services, fire and rescue, and special operation groups such as Urban Search and Rescue and water rescue. The Operations Division is composed of response personnel from three fire stations, staffing three paramedic engine companies, and one truck company. The shift Battalion Chief oversees the activities of the three fire stations on their respective shift. The communications division oversees communications for all city operations including fire and police dispatch. The Fire Prevention Division oversees fire and safety inspections, including maintenance of fire protection systems and equipment, and fire and building code enforcement for all public buildings, as well as businesses within the city of Montebello. Fire prevention is also responsible for fire and arson investigation. The Emergency Preparedness Division is responsible for the coordination and training of public safety employees in the event of all major disasters. The Fire Marshal, Kurt Johnson, oversees the Fire Prevention Division and the Emergency Preparedness Division. The city is served by the Montebello Unified School District. M.U.S.D. serves the city of Montebello, portions of the cities of Bell Gardens, Commerce, Downey, Rosemead, Pico Rivera, and Monterey Park, as well as the unincorporated community of South San Gabriel, and a part of the unincorporated community of East Los Angeles. The District is one of the largest and most diverse in Los Angeles County with an enrollment of more than 35,000 K–12 students and 30,000 adults enrolled in adult education. Applied Technology Center, a $30 million facility opened in the fall of 2011, is a vocational high school with state-of-the-art technical training capable of accommodating up to 750 students. Students wishing to attend ATC are required to apply for admission. Board of education President Edwin Chau stated that ATC offers students a "rigorous academic curriculum and career technical education within a full-day schedule." Montebello Unified, has made it their goal to ensure students graduate ready and college prepared." The project was paid for with a $98 million Measure M bond, which voters passed in November 2004. Saint Benedict School, a private parochial grammar school, K-8, is operated on Saint Benedict Church property. It opened in September 1941 and was formally dedicated on Pearl Harbor Day, December 7, 1941. Our Lady of Miraculous Medal Parish School. The school first opened in 1954 through the leadership of the Daughters of Charity of St. Vincent De Paul. A private parochial high school, Cantwell-Sacred Heart of Mary High School, is also located in Montebello. Originally two separate gender-segregated High Schools, they merged in the 1991, the Sacred Heart of Mary campus moving to the Cantwell campus. St. John's Lutheran Church has a Kindergarten-8th school on a site adjoining the church. The Montebello Parks and Recreation Division provides recreational services for all age groups, from small children to the growing senior citizen community. Their Mission Statement is: "Creating Community Through People, Parks & Recreation". Grant Rea Park, is home to the Montebello Barnyard Zoo, Pony Rides, Train Rides and a miniature water park. Also home to the Montebello Batting Cages, 6 hitting cages, Hardball, fastpitch and Lob Softball machines www.MontebelloBattingCages.com. Bicknell Park, where the Montebello Genocide Memorial is located. The oldest park is Montebello City Park, 1300 W Whittier Blvd. which is now home to Montebello Skateboard Park located where, in the 1950s, were quiet fishponds. The skateboard park was opened in 2002. Montebello previously had a skatepark between Schurr High School and the Montebello Plaza shopping center. The Sanchez Adobe Park is home to the Juan Matias Sanchez Adobe, the oldest standing structure in the City of Montebello, built in 1845. Ashiya Park, named for Montebello's sister city in Japan. The park is separated into two sides that are divided by Beverly Boulevard. Henry Acuna Park, named in honor of the only Montebello Police Department Officer who lost his or her life while on duty. In Acuna's memory a Marker of Honor and Tree of Life were placed at the entrance of Acuna Park. Reggie Rodriguez Park is named for a Vietnam War hero and is a 11 acres (4.5 ha) area on which is located the Reggie Rodriguez Community Center, noted for its unique architecture and providing a central location for activities for the youth population in the city as well as a polling station during election periods. Chet Holifield Park is the city's southernmost park, and home to the Chet Holifield Branch Library. The name of the library and park honors Congressman Chet Holifield, 19th District (served 1943–1974). Potrero Heights Park is located at the northernmost point in Montebello, near the border with Rosemead. Montebello Municipal Golf Course's history that dates back to 1928, when it was built as an enterprising country club designed by golf course architect Max Behr. The city purchased the course in 1941. The 120 acre, 18-hole public championship course was remodeled for the 1998-99 reopening held on May 7, 1999. The remodel added 3 lakes, new greens, tees, bunkers and cart paths. Montebello Country Club is now recognized as one of the best municipal golf courses in Southern California. A conference center is located on the golf course grounds is the Quiet Cannon banquet room that holds up to 500 people. There is over 30,000 sq ft (2,800 m2) of private event space to accommodate groups of 25 or more guests. Montebello's municipal tree division is responsible for maintaining the city's trees located in the parkways, street medians, parks and golf course. With an estimated total of 20,000 trees on city property, the tree division has been recognized by the National Arbor Day Foundation for the outstanding management of the city’s urban forest, and has been a continuous recipient of the "Tree City U.S.A." award since 1991. Montebello is located 8 mi (13 km) east of downtown Los Angeles at the southwestern part of the San Gabriel Valley. The surrounding cities are Monterey Park, South San Gabriel, and Rosemead to the north, Commerce to the south, Pico Rivera to the east, and Los Angeles and East Los Angeles to the west. It is also sometimes considered part of the Gateway Cities, and the city is a member of the Gateway Cities Council of Governments. 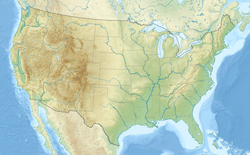 According to the United States Census Bureau, the city has a total area of 8.4 m2 (90 sq ft), of which 8.2 m2 (88 sq ft) are land and 0.1 m2 (1.1 sq ft) or 1.32% is water. The city is easily accessible to the Long Beach- (I-710), San Gabriel River- (I-605), Pomona- (SR 60) and Santa Ana- (I-5) freeways. Public transportation is provided by the city-owned Montebello Bus Lines; the service is the sixth largest public transit agency in Los Angeles County with an annual ridership of over 8.2 million. Starting in 1931 with a fleet of four buses, the agency now has a fleet of 66 buses, including five hybrid gasoline-electric buses and serves 14 communities. Montebello LINK is a transportation shuttle offering curb-to-curb service to and from the Montebello/Commerce Metrolink station. Montebello also operates Montebello Dial-a-Taxi, a program offering transportation for senior residents and qualified disabled persons of any age. 15,000 residents utilize this service. Ken Davitian, actor, most notably played the role of Azamat in the movie "Borat"
Mark Salas, born in Montebello, former MLB player. Hagop Sandaldjian, microminiature sculptor, lived and worked in Montebello after emigrating from Yerevan, Armenia (then part of the Soviet Union) in 1980. The City of Montebello has been affiliated with the City of Ashiya, Japan since the inception of the Sister City Program in 1961. Student Ambassadors are chosen to travel to Ashiya every year. The City of Montebello has been affiliated with the City of Stepanakert, the capital of the unrecognized Nagorno-Karabakh Republic, since 2005, when a much controversial move to facilitate the sister city relationship was made by the Armenian National Committee of the San Gabriel Valley and unanimously approved by the City Council. ^ "Montebello". Geographic Names Information System. United States Geological Survey. Retrieved December 10, 2014. ^ a b "Montebello (city) QuickFacts". United States Census Bureau. Archived from the original on April 2, 2015. Retrieved March 25, 2015. ^ a b "History". City of Montebello. October 19, 1920. Retrieved March 26, 2013. ^ "Data Recovery Montebello California (CA) - Data Retrieval Montebello California (CA) - Data Restoration Montebello California (CA)". Datarecoverypomona.com. October 19, 1920. Archived from the original on July 8, 2011. Retrieved March 26, 2013. ^ a b c d e "History". City of Montebello. October 19, 1920. Retrieved August 3, 2010. ^ "Los Angeles". California Historical Landmarks. California Department of Parks & Recreation Office of Historic Preservation. 2004. Retrieved July 30, 2007. ^ Bauer, K. Jack (1974). The Mexican War, 1846–1848. New York: Macmillan. ISBN 978-0-8032-6107-5. ^ "Sixty years in Southern California, 1853–1913, containing the reminiscences of Harris Newmark". American Memory. Library of Congress. Retrieved July 30, 2007. ^ Rasmussen, Cecilia (July 29, 2007). "City names stem from trees, ranches - even a goddess". Los Angeles Times. pp. B2. ^ "Chamber History". Montebellochamber.org. Archived from the original on November 13, 2010. Retrieved August 3, 2010. ^ "Home - City of Montebello". Cityofmontebello.com. Retrieved November 9, 2017. ^ "Montebello, California – Hispanic Gangs | Street Gangs Resource Center". Streetgangs.com. Retrieved March 26, 2013. ^ "Mark Keppel High School". Mkhs.org. December 19, 1938. Retrieved March 26, 2013. 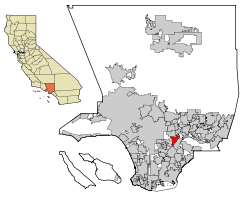 ^ "2010 Census Interactive Population Search: CA - Montebello city". U.S. Census Bureau. Retrieved July 12, 2014. ^ "Montebello (city), California". State & County QuickFacts. U.S. Census Bureau. Archived from the original on April 2, 2015. ^ "Drug Rehab, Montebello, Alcohol Treatment, Drug Rehab, Drug Addiction Recovery And Rehab Programs". Drugrehabmontebello.com. Retrieved August 3, 2010. ^ "A Goat Roast at Chic, LA Wine Festival, Armenian Food Fair, On the Lamb High Tea". Sinosoul.com. May 5, 2010. Retrieved August 3, 2010. ^ "Montebello (city) QuickFacts from the US Census Bureau". Census.gov. Archived from the original on April 2, 2015. ^ "Montebello - Montebello - Population overview". Epodunk.com. Retrieved August 3, 2010. ^ "City of Montebello - City Treasurer". Cityofmontebello.com. Retrieved March 20, 2016. ^ "City of Montebello - City Clerk Barnal-Barajas". Cityofmontebello.com. Retrieved March 20, 2016. ^ "Montebello Mayor Vanessa Delgado surrenders her seat to be sworn in as a short-term state senator". Dailynews.com. August 13, 2018. Retrieved August 23, 2018. ^ "City Council - City of Montebello". Retrieved July 13, 2018. ^ "PUBLIC MEETINGS - City of Montebello". Retrieved July 13, 2018. ^ "COMMISSION - City of Montebello". Retrieved July 13, 2018. ^ "Post Office Location - MONTEBELLO." United States Postal Service. Retrieved on December 6, 2008. ^ "Post Office Location - Montebello Hills." United States Postal Service. Retrieved on December 6, 2008. ^ a b "Community Alerts". City of Montebello. Retrieved March 26, 2013. ^ "Citizen Patrol". City of Montebello. Retrieved March 26, 2013. ^ "2018 Most Diverse School Districts in the Los Angeles Area". Niche. Retrieved November 9, 2017. ^ "Montebello Unified School District | Schools". Montebello.k12.ca.us. Archived from the original on May 27, 2010. Retrieved August 3, 2010. ^ "Montebello High School | Home". Mhs.montebello.k12.ca.us. Retrieved August 3, 2010. ^ a b c "New Montebello Unified School District high school on schedule to open Fall 2011". Whittier Daily News. Archived from the original on March 24, 2012. Retrieved March 26, 2013. ^ "Home". St-benedict.com. Retrieved March 26, 2013. ^ "Monument at Bicknell Park in Montebello, California". Armenian-genocide.org. April 24, 1965. Retrieved August 3, 2010. ^ "Montebello Montebello Skateboard Park Montebello, CA Southern California Skateboard Parks Montebello Skatepark". Socalskateparks.com. Archived from the original on August 9, 2010. Retrieved August 3, 2010. ^ "Juan Sanchez Adobe". LetsGoSeeIt.com. Retrieved August 3, 2010. ^ "MPOA ~ Memorial Page". Mtbpoa.com. Archived from the original on July 14, 2011. Retrieved August 3, 2010. ^ "Reginald Rodriguez, LCPL, Marine Corps, Montebello CA, 17Feb69 32W052". The Virtual Wall. Retrieved March 26, 2013. ^ "Architectural Record Building Types Study | Reggie Rodriguez Community Center". Archrecord.construction.com. Retrieved August 3, 2010. ^ Montebello. "Chet Holifield Library - Montebello California CA". AmericanTowns.com. Retrieved March 26, 2013. ^ a b c "Golf Course". City of Montebello. May 7, 1999. Retrieved March 26, 2013. ^ "Large Banquet Facility Los Angeles". Quietcannon.com. Retrieved November 9, 2017. ^ WRCC. "Western U.S. Climate Historical Summaries Weather". Desert Research Institute. Retrieved February 12, 2011. ^ "Ridership Reports". American Public Transportation Association (APTA). Retrieved May 19, 2013. ^ "Montebello Bus Lines celebrates 80 years". Whittier Daily News. Retrieved March 26, 2013. ^ "Transportation". City of Montebello. Retrieved August 3, 2010. ^ "Dial-A-Taxi". City of Montebello. June 4, 2007. Retrieved August 3, 2010. ^ "Alan Bannister Baseball Stats by Baseball Almanac". Baseball-almanac.com. Retrieved March 26, 2013. ^ "Montebello High School | Home". Mhs.montebello.k12.ca.us. Retrieved March 26, 2013. ^ "Oscar De La Hoya Biography (Boxer) —". Infoplease.com. February 4, 1973. Retrieved March 26, 2013. ^ "Answers - The Most Trusted Place for Answering Life's Questions". Answers.com. Retrieved November 9, 2017. ^ "Judi Evans' Biography". Judi Evans Official Website. Archived from the original on March 2, 2008. Retrieved July 30, 2007. ^ "Bruce Merrifield - Biography". The Nobel Foundation. Retrieved July 30, 2007. ^ The ESPN Baseball Encyclopedia. Sterling Publishing. 2007. p. 874. ISBN 978-1-4027-4771-7. ^ Lawrence Weschler, Mr. Wilson's Cabinet of Wonder (Pantheon Books, 1995), ISBN 978-0-679-43998-1, pp. 58–60. ^ "Montebello Sister City Association". Montebello Sister City Association. Montebello Sister City Association. 2015. Retrieved October 10, 2016. ^ "Despite Azeri Meddling, Montebello City Council Ok'S Sister-City Ties With Stepanakert". Anca.org. Archived from the original on June 15, 2010. Retrieved August 3, 2010. 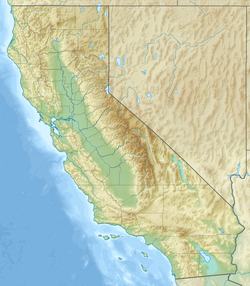 Wikimedia Commons has media related to Montebello, California.